Is Winnipeg ready for a population of one million? Another instalment of the U of M’s Visionary Conversations series was held last week at the university’s Fort Garry campus. An interdisciplinary panel, drawing from both academia and industry, attempted to anticipate the challenges Winnipeg will face as it moves toward a population of one million in the next 20 years. 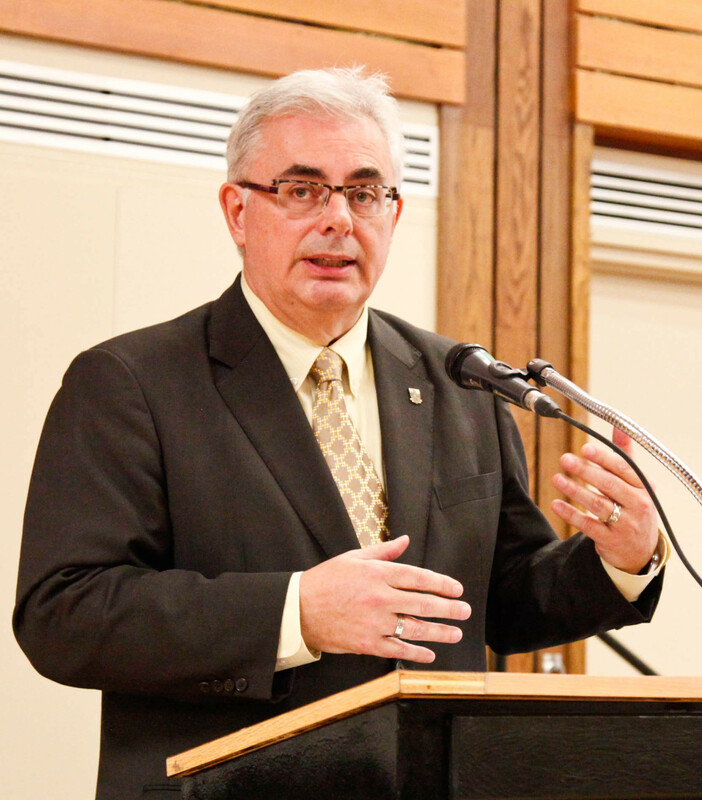 University of Manitoba president and vice-chancellor David Barnard hosted the event, which explored the future health, safety, and economic concerns of a growing Winnipeg. The Visionary Conversations series, having just moved into its third season, is intended to serve as a forum for University of Manitoba academics and alumni to discuss their research interests with the broader community. Students, professors, professionals, and citizens-at-large gathered last Wednesday to hear four experts explain what kind of changes are necessary and why within the realms of education, infrastructure, crime rates, and social structure in order for Winnipeg to prosper at a population of one million. Jim Carr, president and CEO of the Business Council of Manitoba, spoke first, arguing that the future growth of Winnipeg is going to be largely dependent upon immigrants and Aboriginal youth. “If you look at the demographic trends you will see that the birth rate in the indigenous population is much higher than it is in the non-Aboriginal population,” said Carr. Immigrants and Aboriginal citizens make up just under 50 per cent of the inner city neighbourhood population, according to a 2012 report on racism in Winnipeg. According to that report, these same neighbourhoods also endure high rates of crime and poverty. Carr argued that the solution to crime and poverty issues lies in bipartisanship, as well as a commitment to educational reform by government and indigenous community leaders. “If we are going to build a future with the strength within these communities and these talented children, we are going to have to break the jurisdictional paralysis,” said Carr. Brent Bellamy, Winnipeg Free Press columnist and senior design architect for Number TEN Architectural Group, addressed various infrastructure challenges in Winnipeg, including urban sprawl, heritage buildings, the downtown area, and unappealing public spaces. Bellamy said design models that keep human interactions in mind—such as those seen in River Heights, Osborne and Corydon, and the Exchange District—are key for building a “loveable city.” He said a loveable city is important to retaining immigrants and young people. Crime specialist and sociology professor Rick Linden hypothesized on how Winnipeg might shake its old reputation as a Canadian crime capital. He described a new tri-model program intended to fight high crime rates. The tri-model program involves “smart” policing: targeting crime hotspots and repeat offenders, integrated service delivery, and community and social development, such as the LiveSAFE initiative. “A vision for the future is that we get this program up and running within the next few months, that it proves successful, and that we are able to move it into other high crime parts of the city and accomplish the vision of ending high crime rates effectively,” said Linden. Wanda Wuttunee, native studies professor and director of the Aboriginal Business Education Partners at the Asper school of business, ended the panel discussion, emphasizing the importance of thinking about the future of Aboriginal youth. Wuttunee mentioned a report on racism showing that, despite many Aboriginal advocate groups, many people of Winnipeg hold the view that Aboriginal individuals bring their problems upon themselves. The end of the conversation focused on what needs to happen within the next couple of decades to prepare Winnipeg for a population of one million. The panel agreed that challenges could be met through sustainable planning frameworks, community engagement, and strong leadership skills.